For those who love homes rich in history and character, Baker is a 1900s heaven. Victorians stand grandly among single-family arts-and-crafts, remodeled duplexes—and even an old schoolhouse that’s been converted into condos. Nesting between Broadway, the South Platte River, 6th Avenue, and West Mississippi Avenue, the flavor here is eclectic; the location, convenient; and the vibe, funky. 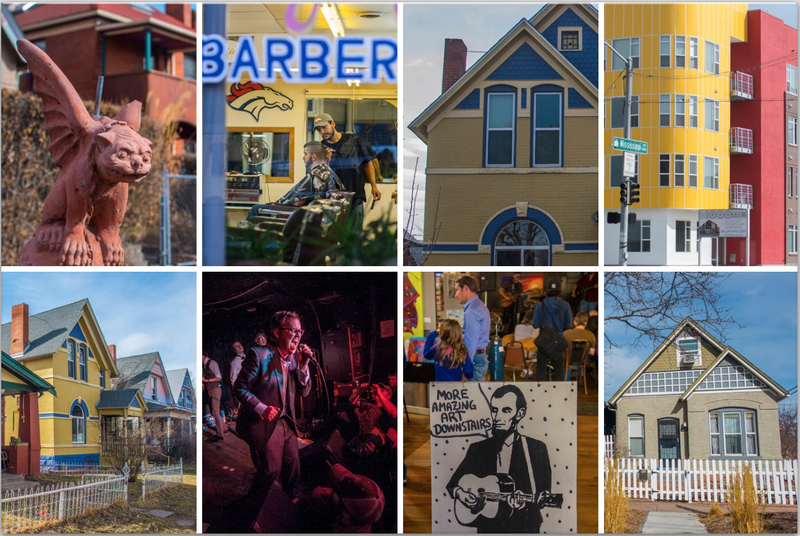 Preserving and restoring the neighborhood’s original glory is a priority for Baker residents, so you’ll find few chains and a whole lot of independent restaurants, bars, vintage furniture and clothing stores, galleries, music venues and theatres. South Broadway—especially between West 1st Avenue and Alameda—has emerged as a popular nighttime destination for those looking for an alternative to the more mainstream LoDo scene. Centrally located, it’s a quick zip to just about anywhere—east to the hugely popular Washington Park, north to Downtown Denver, or south to I-25. Staying close to home is also a great option though, because you’re steps to Baker’s eclectic mix of shops, restaurants, bars, and the independent Mayan Theatre. Baker is a historic, beautiful, creative, surprisingly quiet, and pleasant place to live.